Texas Director Adrian Shelley speaking at a VW Settlement community engagement meeting in Fort Worth. Volkswagen’s emissions cheating scandal led to a $14.7 billion dollar settlement. Basically, what Volkswagen did was install what are called “defeat devices” which were programmed to run differently during emissions tests so that they appeared to be much less polluting than they actually are. In some cases, NOx (nitrogen oxides), which is not only harmful but is also a precursor to ground-level ozone, was up to 40 times higher than what the cheating emissions tests revealed! By cheating on emissions tests, Volkswagen harmed public health, causing at least 59 premature deaths and over $450 million in health and social costs (Barrett, 2015). The settlement provides Volkswagen with a chance to compensate owners of vehicles impacted by the defeat devices, mitigate some of the harm done, and reduce future harm using zero emissions technology. The Volkswagen Settlement is essentially divided into three parts: a personal vehicle buyback program, an environmental mitigation program to reduce the harm done, and a zero emissions vehicle investment commitment to prevent more harm and promote zero emissions technology. More information on the personal vehicle buyback program can be found at VW’s settlement website http://www.VWCourtSettlement.com. If you have an eligible vehicle, you may also be eligible for additional funds through the Bosch VW Settlement (https://www.boschvwsettlement.com/en/Home/FAQ). The Environmental Mitigation Trust will be administered at the state level and will fund projects to upgrade and replace dirty diesel engines. Texas will receive $209 million dollars. Once a beneficiary is designated, projects will be determined. We are collecting feedback on these projects, discussed below. The third fund is the Zero Emissions Vehicle Investment Commitment, also known as Electrify America. VW will be allocating $2 billion dollars toward zero emissions infrastructure and educational campaigns to promote their use. The City of Houston is among the first round of cities to be supported by this fund. Public Citizen, alongside Houston coalition partners Coalition of Community Organizations, t.e.j.a.s., and Air Alliance Houston hosted informational meetings regarding the Volkswagen Settlement at Austin High School in Houston and at the Houston Area Research Center in the Woodlands in May and June. 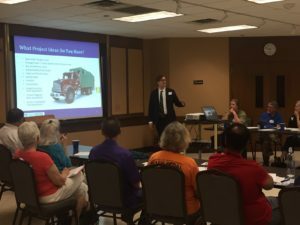 Given that both the Houston area and the Dallas-Fort Worth area are in non-attainment for ozone and that this settlement could help improve air quality in both regions, we hosted additional informational meetings last week in Dallas and Fort Worth with our co-sponsors Tarrant Coalition for Environmental Awareness Group, Liveable Arlington, and Arlington Conservation Council, Fort Worth Sierra Club Group and the Dallas Sierra Club Group. While some other states have had a formal community engagement process, an agency of the State of Texas has yet to hold public meetings regarding the settlement. That’s where Public Citizen and other organizations have stepped in to gather important feedback from community members in regards to what sorts of projects hold the most interest. These projects are limited to those that reduce NOx emissions through engine upgrades or replacements, such as replacing old freight trucks, school buses, dump trucks, etc. A portion of the funds will be available for electric vehicle charging infrastructure. If your group, city, or region is interested in learning more about the Volkswagen Settlement, please contact Stephanie Thomas at [email protected] to learn about upcoming community meetings. Good News for Houston, Corpus Christi- So. California ports cut diesel emissions 80%! A clean-trucks program at the ports of Los Angeles and Long Beach in California has shown quick progress, with an 80 percent decline in diesel emissions expected by the end of 2010 — a year ahead of schedule. So far, the program has reduced diesel truck emissions at the Los Angeles port (pictured) by 70 percent compared with 2007 levels, Villaraigosa said. Long Beach has seen similar results, according to Mayor Bob Foster. The program is part of a larger effort to reduce diesel emissions at the port complex, one of the major sources of pollution in Southern California. Increased rates of cancer, asthma and other serious health ailments for area residents have been attributed to port pollution. Villaraigosa and Foster unveiled the promising figures during a briefing at the Port of Long Beach on Thursday, when U.S. EPA Administrator Lisa Jackson announced $26.5 million in federal grants for clean-air programs throughout Southern California. This is really great news for our port cities, whose dirty air is tied at least partially to the pollution from the ports. Diesel emissions also contain black carbon particles, which can have a much greater effect on the climate than CO2, methane, or any of the other greenhouse gases. Also, as a particulate, it can get lodged in your lungs and cause all sorts of respiratory ailments. Cutting black carbon should be a major goal, and one which the Ports of LA and Long Beach seem to be tackling very well. Farbeit from me to advocate that Texas ever in any way should try to be like California, (*smirk*) but this shows that specific programs designed to tackle specific problems can be very effective. The Pollution on the School Bus goes Down, Down, Down! Do you like clean air? Do you like clean air for KIDS? Seems like the rest of the state does, too. According to TCEQ, a program to retrofit school buses around the state has been able to retrofit 2300 buses statewide. Even more amazing was the demand for the program exceeding its allotment by 40%, meaning for every 3 school buses we wanted to fix, we could only fix 2. However, that means that for tens of thousands of kids, they are now riding in much better buses, and those school districts who gut put on the waiting list just have to wait for more money from the Legislature to get their buses clean, too. Local ISDs, schools, parents, and kids love this program because of how much it reduces toxic air pollution from our buses, and does so without taking money out of the classroom. Local businesses and residents should love it because it is making their communities cleaner. This is a win for air quality, a win for school districts, and most importantly, a win for children’s health.